Soon after starting at CMAG our Director delivered a floortalk on Sidney Nolan's Kelly paintings. As we celebrate the 100th year anniversary of Nolan's birth in 2017 we are taking the opportunity to make the text of this floortalk available online. Thank you for coming today to hear about Canberra’s own Nolan paintings. I am Shane Breynard, and for those of you who I haven’t met before I am the Director, here at Canberra Museum and Gallery and of the Historic Homes, Lanyon, Calthorpes and Mugga Mugga. I started here just a few months ago and am enjoying the opportunity to give talks on the different things in our collection and that we have on exhibition. 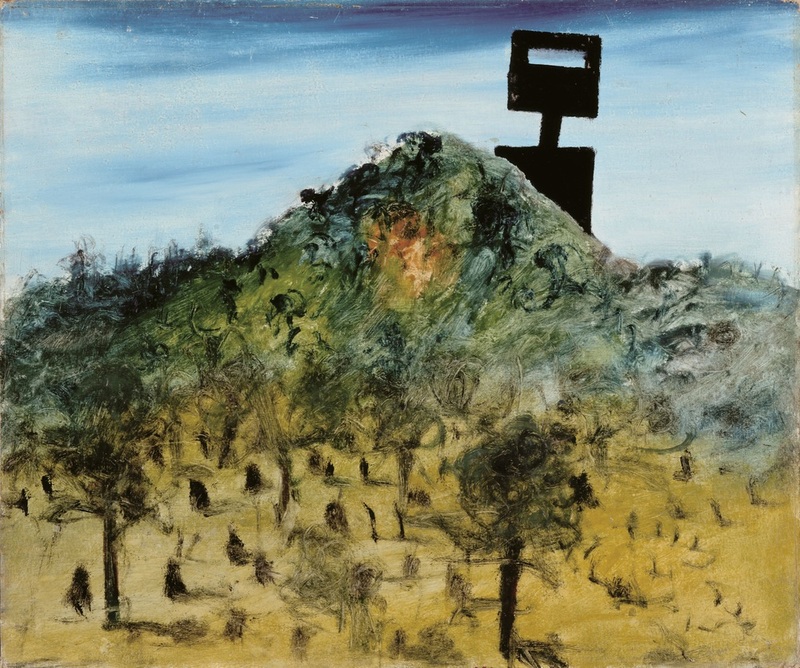 Sidney Nolan has been described by many, indeed just two weeks ago by Edmund Capon, as “the most outstanding Australian artist of the 20th Century”. And Nolan’s Kelly paintings are perhaps the most written and argued about Australian paintings we have. There is so much in these paintings, and there are so many angles that we can approach them from. We will be presenting some of Nolan’s works on paper from his ‘Rimbaud’ and ‘For the Term of his Natural Life’ series later this year in a small exhibition that is being organized by our curator of visual arts Deborah Clark – and we are looking forward to providing a further opportunity to discuss Nolan then. Today I will focus on the Kelly paintings. I will explore Nolan’s fascination with Kelly, and look at how these energetic paintings, created by a young artist in his prime, sit within Nolan’s biography. 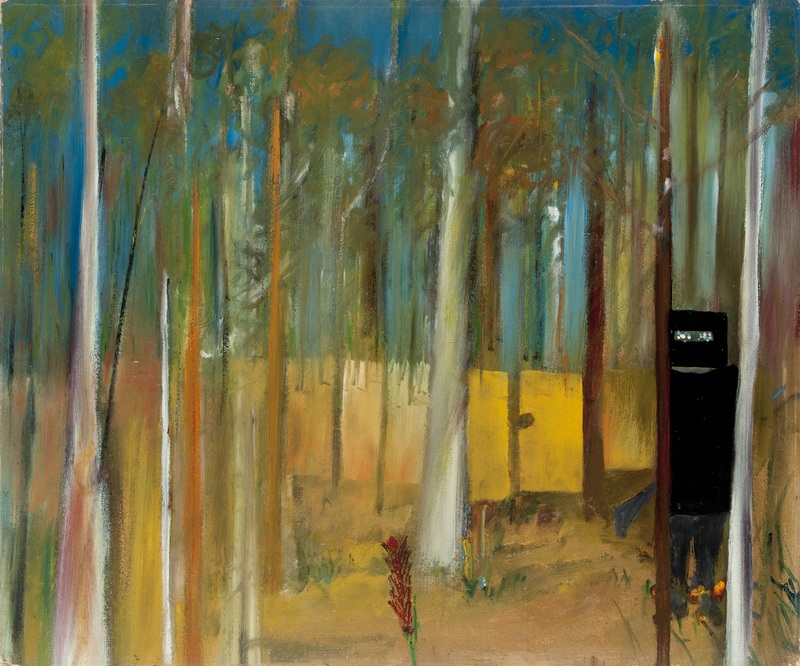 The series of paintings that surround us were gifted by Nolan to the Commonwealth in 1974 and were exhibited within the Lanyon Homestead - when it was first opened to the public. The works remain the property of the Commonwealth and we are very pleased to be looking after them. Environmental conditions, poor visitation and the risk of bush fire were all reasons behind the decision to move th collection from Lanyon to our gallery here in the city. I think of this room as a kind of Aladdin’s Cave… it is full of brilliant images, which are the jewels from the work of one of Australia’s most celebrated artists. This painting behind me, Kelly 1946, is the single painting that kept coming back into my mind as I prepared my notes for this floortalk. In a way I think this painting is a key to unlocking and enjoying more deeply the rest of Nolan’s works. I don’t know if it is the way that Kelly appears at a landscape scale, rising like a titan? Or because of the mountain’s similarity to many of Canberra’s mountains? Is it Mount Ainslie, or, with Kelly rising, it looks a bit like Black Mountain with its Telecom Tower? I also like the way that the mountain has a glowing heart, it is a landscape with a beating heart. Our Nolan educator, Kay Whitney, tells me this hill here is a dead ringer for the one opposite the Glenrowan Pub. Whatever the associations are, this painting gives a great insight into the themes that I think drove Nolan – which are the interpenetration of landscape and figure, and of situation and myth. He explored these themes repeatedly in his art right through his life. As the former director at CMAG , and a Nolan scholar, Peter Haynes has commented ‘the landscape is not a backdrop but is a ‘central element’ in Nolan’s Kelly paintings'. Sidney Nolan was born in 1917. When he painted the Ned Kelly paintings we have here, in 1945-46, he was a young man in his late 20s. Then, as now, this is a time of life when we start to grapple more fully with our adult identity. We become more aware of ourselves as agents of action playing on an adult stage, and we start in earnest to explore and test the narratives that shape our lives. We can see, in these very energetic paintings, Nolan as a young man in his late 20s responding to the events and feelings of the twentieth century. I want each of you to close your eyes and imagine you are seeing an image of Ned Kelly in action. Now open them again. If you saw a black mask with a horizontal slit in it, please put up your hand. Well, mine certainly has to go up because this mask, which we see in so many of the pictures around us here, has become my own very personal picture of Ned Kelly. But these paintings aren’t a simple storyboard of Kelly’s life. Nolan didn’t start at the beginning of Ned Kelly’s story and depict it through to the end. Rather, Nolan used Ned Kelly’s life to speak about the oppression of Australians of Irish descent - both in Kelly’s time and his own; and to speak about contemporary oppressions which included his personal experience as a conscriptee during the second World War. Nolan used Kelly’s life to speak about his personal experience of artistic research and turmoil at a house which has now become an art gallery in Victoria called Heide. And he used Kelly to speak about the way that, in his lifetime, the Australian landscape was starting to permeate the consciousness of artists in a more modernist way than the then famous Heidleberg school of Streeton and others. This is a good place to briefly remind us of the Kelly story - without going into too much detail. 65 years before Nolan created these paintings, and I think not incidentally, Ned Kelly was also a young man in his twenty’s. A young man full of energy. Kelly was 26 when he was hung for murder in the Melbourne Gaol. And remember Nolan was 27 when he painted his first Kelly paintings. I think of the Kelly story in three stages… As I review them quickly, you will be able to recognize glimpses of the story around us. Sometimes the titles of the paintings serve as clues. As background to the story we need to know that Kelly’s family were very poor farmers in rural Victoria - and that they were in trouble with the law because of cattle and horse stealing. Indeed Kelly had gone to prison for horse stealing at the tender age of 16 in 1870. He was locked up a second time for three years from 1871. But the main drama occurs later, in 1878. Firstly, Constable Fitzpatrick arrives at the Kelly’s country cottage with a warrant for the arrest of Ned and his brother Dan. There was a fight and Fitzpatrick accused the Kellys of injuring him with intent to murder, whilst the Kellys accused Fitzpatrick of trying to pull their sister, Kate onto his knee. Some of the family were captured and imprisoned over the incident - but Ned and Dan Kelly escaped. There was a long police chase in the bush which finished with Ned and Dan and their friends, Steve Hart and Joe Byrne, gunning down several police officers at a camp at Stringybark Creek. Constable Fitzpatrick escaped – hiding through the night in a wombat hole! Next was the period when Kelly and his gang, including Steve Hart and Joe Byrne, honed their roles as outlaws. They performed several bloodless bank robberies and earned a reputation for charm as they left behind their written story of police oppression and injustice. And finally, there was a siege at Glenrowan sparked by the Kellys' unsuccessful attempt to derail a train full of policemen. In the battle that ensued the band donned helmets fashioned from ploughshares bolted together. Ned was captured while the others perished in the burning Glenrowan Pub where the siege occurred. Ned was later found guilty of murder and was of course hanged in Melbourne Gaol. As Andrew Sayers has commented Nolan’s use of the story comes some 70 years after Ned Kelly’s life. 70 years on, in the 1940s Nolan, and indeed Australians as whole were still fascinated by this. But it was only after spending time in the Victorian countryside, stationed as a conscriptee in the Wimmera, and later, travelling around the areas where the events of the Kelly story unfolded that Nolan’s passion for Kelly’s story took hold. Why does this story persist? Nolan wondered. Sayers wonders too, and so I think do all of us here. the keen readiness to challenge authority and oppression? Was it that for Nolan, as for us today, the Kelly myth allows us to meditate upon the role of violence, justice, love, authority and personal responsibility in our own lives? Was it Kelly’s own use of words to advocate for his own poor family, for the Irish and the oppressed generally, that gave his story extra mileage? You may have heard of Kelly’s Jerilderie letter which fiercely argued on behalf of Irish Australians and against the Victoria Police and even the British army. It is helpful to look briefly at Nolan’s own life at this point… He had grown up in St Kilda, the son of an Irish ex-convict, and those of you who know Melbourne will recognize St Kilda’s pier ‘with its boardwalk and white railings terminating in a quaint kiosk’. Some of you may be able to glimpse this work just around the corner, Under the pier (1945). In 1938 Nolan, at 21 years of age, met John and Sunday Reed and this began a series of intense relationships that had a profound effect on him. Nolan rejected formal art training and was influenced by the avant-garde atmosphere and splendid library at the Reeds’ home, called Heide - after the nearby Heidelberg township. At the Reeds’ home Nolan read the poetry of Arthur Rimbaud. Now Rimbaud’s writing is often concerned with the close interaction of the human spirit and the landscape, so it has much in common with the paintings we see here. We have a wonderful series of works on paper that Nolan created as a meditation on Rimbaud which we will exhibit upstairs in Gallery 5 later this year. Nolan also spent long hours at Heide absorbing the works of Picasso, Klee, Matisse, Cezanne and the flat paintings of Rousseau. His enthusiasm for the modernist movement was freshly expressed in two early paintings… One called the ‘Head of Rimbaud’ showed remarkable similarity to the black masks in this exhibition and the other which was called ‘Moonboy’ was a startlingly simple portrayal of a head, perhaps a forerunner of the big head images you see everywhere around you here. In 1942, Nolan was a reluctant conscript in the army and he was stationed in the far west of Victoria. Here he began to paint the Australian countryside in a new flat modernist way which we can in the works here. In 1943 Nolan met Max Harris who was the editor of a poetry journal which unknowingly published poems which were really just a hoax, called the Ern Malley poems. In 1944 Nolan went Absent Without Leave from his army duties. No wonder he had so much immediate sympathy, as a fellow fugitive, with Kelly! Nolan’s experience of authority and violence in the army must also have coloured his vision - and prompted empathy with the violence of the Kelly story. In 1945, Max Harris and Nolan travelled through North Eastern Victoria together, and they steeped themselves in the Ned Kelly stories of the locals. Nolan even claimed that his grandfather had been one of the police troopers who chased the Kelly gang in the 1870s. It was after these trips, and, mostly working flat on the table at Heide in the company of the Reeds, that Nolan painted the works you are looking at now. He used house paints called Ripolin which was like Dulux. This paint was cheap and dried quickly. The paint was also runny so he painted flat, on a cheap board base. After his brilliant evocation of the Kelly story at Heide, Nolan left the paintings behind and went to Queensland in 1947. He referred to the Kelly story in later paintings but never with the immediacy he captures in early works, never with the sense, as Andrew Sayers puts it, ‘that in the next moment [after the picture] everything will change’. Indeed, Nolan was very interested in photography and film. Some say you can even see the influence of Walt Disney in the almost cartoon-type eyes he has chosen to paint in Ned’s masks. Well, we can certainly see the ‘horizoned head’ in several paintings here. But Kelly’s mask, the television set, in Nolan’s work is situated in the landscape - which is profoundly important in his work. In this painting called Kelly and Sergeant Kennedy , Nolan links his vision of Kelly with the defining role of landscape. Kelly is part of the bush with bush-coloured pants but Sergeant Kennedy here is uncomfortable and his electric blue uniform is definitely not part of the land. As Peter Haynes again observed, quite acutely, this painting shows Kelly and Sergeant Kennedy not just in the landscape but interacting with it. In Kelly in bush we see, as Andrew Sayers says, ‘some of the qualities of the actual bush at Stringybark Creek – dense, concealing, and dominated by tall, straight trees. 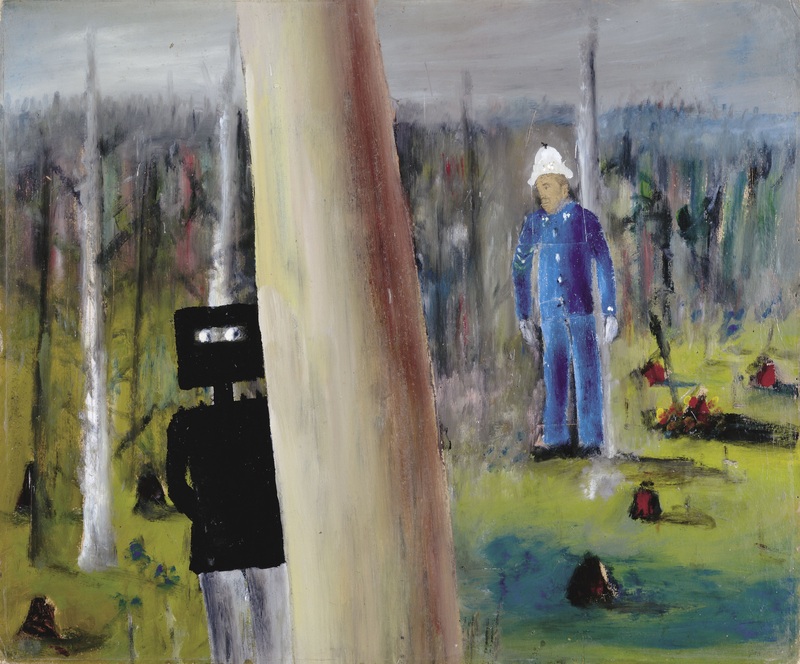 In the 1946-47 paintings, however, Nolan abandoned these claustrophobic forests, opening up the landscape… [Eventually] in the painting Ned Kelly, the outlaw rides through a typical Wimmera landscape; a sliver of sky is brought from the distance and placed in the aperture of the mask’. Nolan apparently commented that this ploy gave the ‘maximum feeling of space’ and I can see how he felt that, can you? The quality of space and distance is one which all of us ponder as we roam the Australian landscape. In Policeman in wombat hole we see Nolan’s delight inpushing the action to the front of the picture frame as some commentators have put it. Peter Haynes, again put it well when he pointed out that this painting uses humour which is a bit out of touch with the seriousness of McIntyre’s situation! But there is a spontaneity and freshness about it with its square wombat hole with its owner looking on with amusement, the surreal flowers above and the magpie pretending nothing has happened. 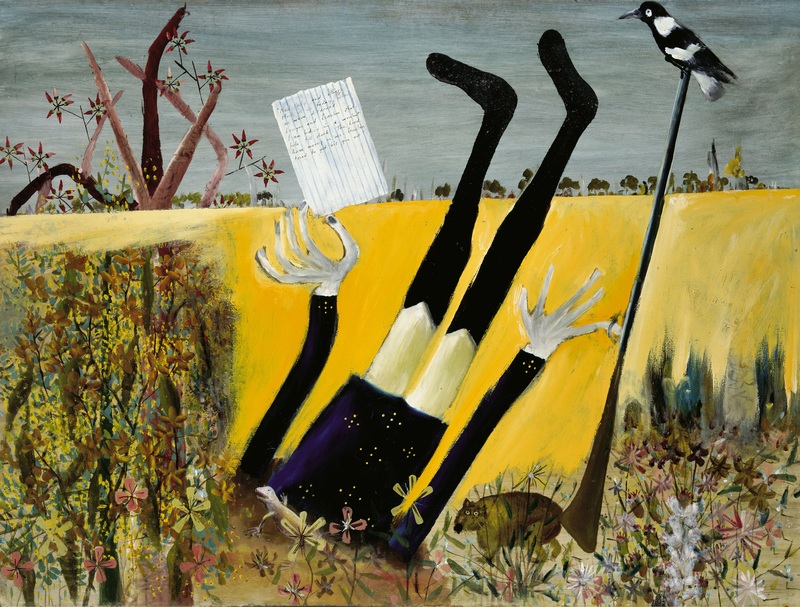 In other works we see the interplay of landscape and figure– through the slit in Kelly’s mask… Here in The Wombat Hole we see the protagonist literally with their ‘head in the sand’ becoming a part of the landscape – the magpie certainly thinks so. When he used these Australian stories Nolan was trying to locate them in spaces that we would recognize but also trying to portray them so that they gained the power of a myth. In other words, he tried to use the known details of our existence to reveal something that was constant, something which was underneath these things. A myth then does not need to stick particularly close to the original storyline. Think of Shakespeare. He used many historical and classical stories and he reshaped them to reveal some of the deepest truths about our lives. This is what Nolan is doing here in this room through staging his own production of the Kelly story. Nolan was pleased to donate these paintings to the people of Australia and to know that they would be initially held at his beloved Lanyon. I have been told however that he also expressed an understanding that at a later date they might be shown for periods elsewhere in Canberra as well. Now here they are, in a venue which is safer from the ravages of bush fires, and where they will endure and be seen by many more of us. We are lucky to have many more of Nolan’s works in practically all of the national collecting institutions we have here in Canberra. We should continue to use his images and his courageous exploration of experience, and of myth, to fire us with new energy. It is an energy which is desperately needed as we face the issues of the twenty-first century. I’d like to leave you with a question posed by McMaster in one of her poems, a question that keenly reflects Nolan’s fascination with the interplay of personal experience, war and peace, myth and place. What traces will we leave, do you think?